Mark Kaprelian joined the Rockville Brass Band in 2012 and has served as a board member and treasurer for the band since 2013. 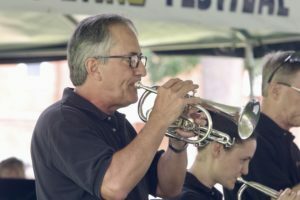 Mark grew up in Wisconsin, where he studied trumpet with Jack Niccolai and John Hemkes and played with the Kenosha Pops Concert Band and other local ensembles. He obtained a Bachelor of Arts degree from the University of Wisconsin-Madison, where he played in the symphonic band, wind ensemble and jazz ensemble under the direction of Mike Leckrone and Richard Davis, among others. Mark later obtained a law degree from the University of Michigan, where he played in the jazz ensemble under the direction of Louis Smith. Mark retired from the regular practice of law in 2012 following a career that included work for a private law firm in Chicago and positions with the U.S. Securities and Exchange Commission, The Northwestern Mutual Life Insurance Company, and the Public Company Accounting Oversight Board. Mark has played cornet with the band since then but is also happy to play trumpet and flugelhorn at every opportunity.